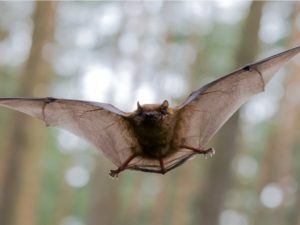 If you’ve got bats in your home, removing them should be as easy as trapping and releasing, right? While this is a commonly used technique for removing other critters like rodents or raccoons, trapping bats is not something we recommend trying. Their fragile wings are made up of many fine, delicate bones that are easily damaged, and their protected status in many areas makes it a crime to harm bats in any way. The key to removing a bat infestation from your home quickly is early detection of their presence; and the key to early detection is knowing what signs to look for. One of the easiest ways to tell if you have bats is to look for their waste, or guano. Generally found in small piles underneath where the bats are roosting at night, guano is small and black in appearance, with a dusty consistency. Another strong indicator of unwelcome bat presence is finding wet areas around entrances and exits to your home, as bats commonly empty their bladders before entering or leaving a building. If the infestation is sever enough, you may notice staining on roofing soffits or your ceiling. Why is trapping a bad idea? Trapping bats poses a number of problems for the safety of both you and the critter, and can have legal repercussions in some situations as well. Without proper training and equipment, it is possible to contract disease through contact with bats, or their guano. Additionally, bats are easily injured by traps, and their protected status in many areas means possible legal trouble in the event that you accidentally harm a bat when removing it from your home. Exclusion is the preferred method of bat removal by reputable animal removal services like Critter Control® of Fort Worth. We understand the important role these creatures play in the world, and take every precaution to keep you and them safe throughout the removal process. For any questions or to schedule a home consultation, contact us today at 469-805-6267.